Eighteen months after it launched, AppleInsider re-examines the Setapp subscription service to see if the model works for users —and what apps have joined it. 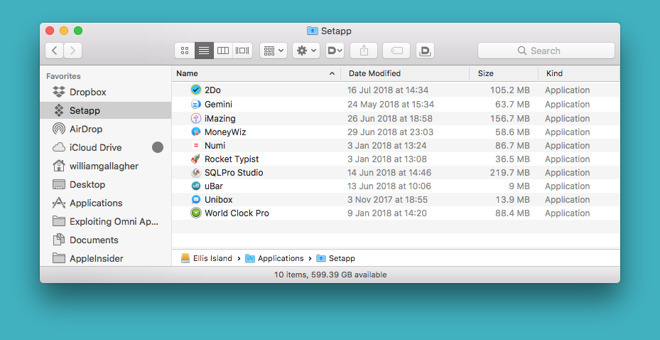 Back in January 2017, Setapp by MacPaw was a bold new idea to get users more apps and to make developers more money. You could use any app in its collection and the developers of the apps you used got a portion of the one subscription fee you paid Setapp. There was nothing quite like it and 18 months later, there still isn't. When it began, it was being described as a Netflix of software but really it's much more like Adobe's Creative Cloud. A single fee gets you full and unlimited access to a range of apps. If you don't use any at all, fine. If you use every single one, terrific. Either way, you're paying $9.99/month and the hope was that everybody wins. At launch on January 25, 2017, AppleInsider reported the news that Setapp had 60 apps. A full hands-on review just two days later revealed it was already up to 61. Today, that app count is 120 and more significant than how many apps have joined is how many have left. We make it that just one has left yet continues in business. Alternote, an quick-access tool for Evernote, is still available online but not in Setapp. A second one, Pixa, has also gone from the service but it's been discontinued entirely. Also, My Wonderful Days has been renamed Journey and continues in Setapp. So that's a single app gone in 18 months and a total of 61 added, literally doubling since AppleInsider last looked at the service. If you'd bought the service when it launched and stayed with it until now, you'd have spent $179.82 on it. However, we worked out that to buy all of the original apps outright would've cost you $1,770.50. Even if that number hadn't doubled, you'd still be better off having paid the subscription as compared to buying all of the apps. That's not a fair comparison, though, because no one is going to want all of Setapp's collection of apps and no one is going to use them all. Also taking up some of the spots in the 120 are apps that are quite similar to each other. So for instance there's Canary Mail, Boxy and Unibox email clients. That's inevitable, though. If you only end up using one of them, there's nothing wrong with having had a choice. What's less great is that like with any collection or bundle, there are going to be apps that feel like padding. Back in January last year, for instance, we felt the calculator Numi was one of these. It was in beta, so you could've got it direct from the developer for free, for one thing. Now 18 months on, it's still in beta. Of the apps added since our last look, though, there are more headline ones. 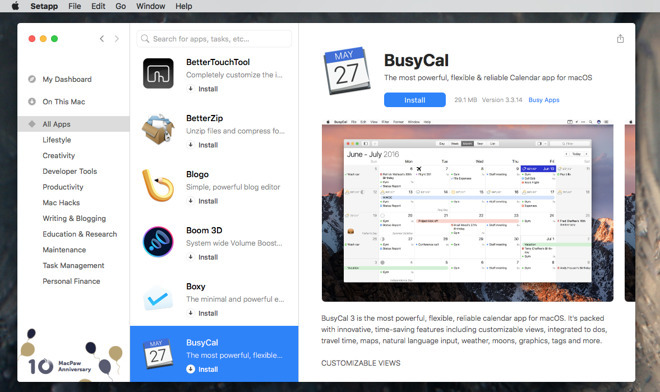 BusyCal is a $50 calendar that is particular powerful, for instance. Then there's Bartender 3 which is one of our top five recommended menu bar apps. BetterTouchTool recently got a rave review too and so did Timing 2. These are on top of last year's headliners, all of which are still present. 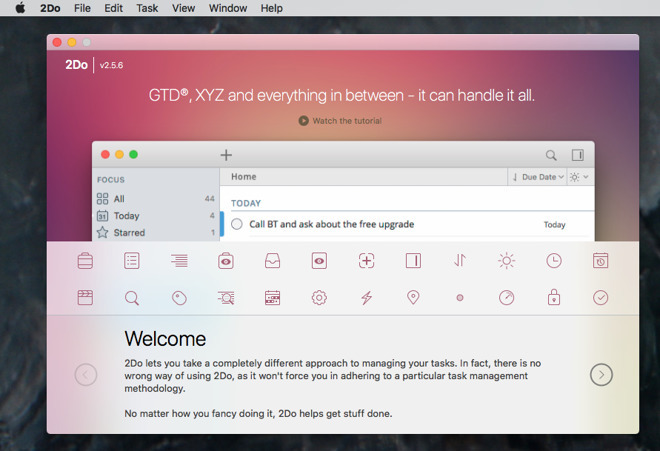 So there's Screens, an app for remote-controlling your Mac. 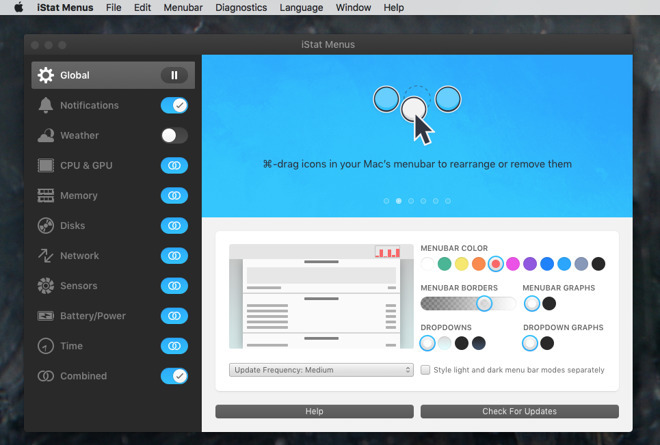 There's Ulysses, the writing tool, mind mapper iThoughts X, and troubleshooting app iStat Menus. You won't find any games: everything is meant to help you create work or to be more productive. Everything is also meant to be quick: the aim is to find you the app you want from the set and then install it without fuss. That works so well we've accidentally installed three of them. That's because Setapp's own application, the installer for all of these, is good the first time you search for something but not the second. Say you search for the word better' to get BetterTouchTool. You type better' into the search box, hit return and you get your results. You always get several results: this time as well as BetterTouchTool there's also an app called BetterZip. In order to search for something else, you go back to that search box and delete the term, enter something new and hit Return. Only, Setapp hasn't actually done a new search: unless you positively click away onto a separate heading like All Apps and then come back to searching, it keeps the previous results. Hitting Return, then, does not start the new search, it passes that Return on to whatever app is highlighted from your previous results. Every app in Setapp interprets Return as being the same as clicking on the Install button. So until you understand what's happening and then also remember to work around it, you end up with apps installing seemingly by themselves. It's a small issue in an otherwise fast and seamless way of installing apps. Uninstalling them is more of a problem: there is a long page of instructions on the Setapp website but it boils down to a recommendation to use the app CleanMyMac. CleanMyMac is one of the best apps on the Setapp service but you're already wondering how to uninstall that one if necessary. When you intend to install an app, you pick it from the list, read a description if you're not sure, and then click on Install. If you've already got an older, non-Setapp version of the app then you'll be asked if you're sure you want to install the new one. Otherwise, the installation happens rapidly and mostly within Setapp itself: you don't have to download an app, find the installer and run it separately. So long as you keep paying your monthly subscription, that's it. You've got the full, unlimited app, it's not interrupted by ads and it's not a time-limited trial version. Then, too, you automatically get every update to the apps you use and you don't have to pay more when the list of apps grows. All of the apps live in a Setapp folder within your Applications one. There's also a Setapp folder added to the sidebar in every Finder window. This is something that's been improved. Previously when we said all of the apps live in that Setapp folder, we meant all of them. Whether you downloaded them or not, an alias of every single available application in Setapp was presented to you. It's not as if it took up much room with these aliases but hunting through to find the ones you had downloaded took time. Now the Setapp folder on your Mac only shows what you have chosen to install from the set. There's no good way for us to judge how many apps you're likely to install. We can tell you that looking at the 120, there were some 11 we immediately wanted to use so that's around 10 percent. 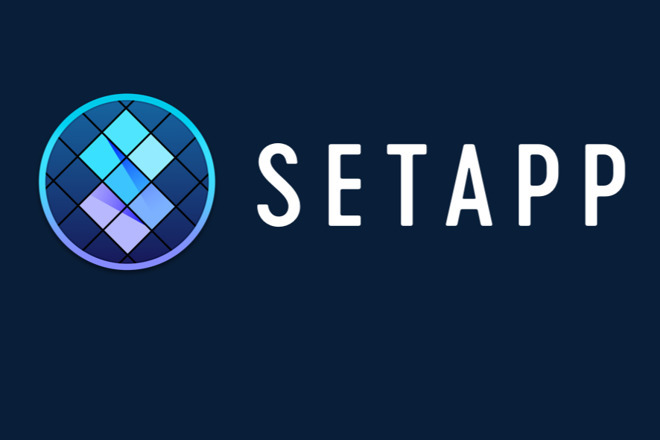 There is, though, a good way for you to judge it for yourself: you can download Setapp and use it for free for a seven-day trial. Thereafter Setapp costs you $9.99 per month if you pay monthly or $8.99 per month if you pay annually. There is also now an educational discount price of $4.99 per month for students.